Year in Photos: 1/eight/2011 Tattoo? Saw this on a auto parked outdoors our favorite coffee shop this morning. I’ve been thinking for a extended time about obtaining a round tattoo more than the best ball part of every single shoulder – either a moon and sun, or a tree in two seasons, or a compass — some thing representing time and spot, two things I appear to be constantly looking for. 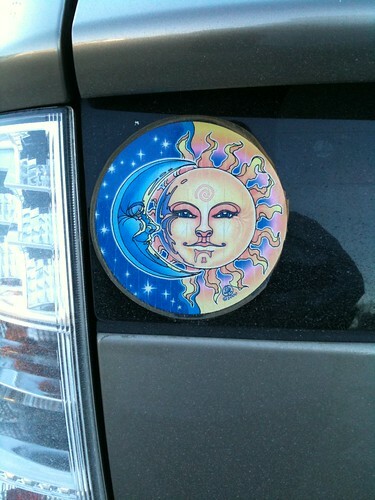 This sun/moon sticker is receiving added to my list of possibilities. I specifically like the crow’s feet at the corners of their eyes.